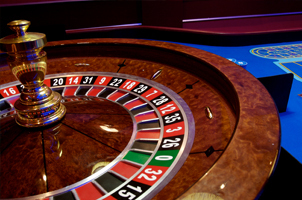 Types of roulette bets. Find out about inside and outside bets here. Which ones are better to make in order to win more? A straight bet refers to a bet on an individual number. The bet is put right in the centre of your number's square. A split bet refers to a bet that is made on two connecting numbers, either horizontally connected or vertically connected. The bet is put on the middle line between those numbers. A street bet refers to a bet that is made on three-in-a-line numbers. The bet is put on one of the number's end line, whether on the right or left of the table layout. A square or corner bet refers to a bet that is made on numbers within a square. The bet is put on the vertical and horizontal line intersection of those four numbers. A double street or six line bet refers to bet that is made on adjoining streets. The bet is put on any corresponding intersection where two kinds of street bets could be put on. Keep in mind that these bets usually have much smaller payouts, though they have greater chances of winning. A bet from 1 - 18 refers to a bet made on a low number. A bet from 19 - 36 refers to a bet made on a high number. A black or red bet refers to a bet made on a colour that will show up. An odd or even bet refers to a bet made on an odd or even number. A dozen bet refers to a bet made on a group of a dozen numbers. A column bet refers to a bet made on a dozen numbers of any vertical line. The bet is put on a space under the string's last number. A snake bet, in essence, refers to a dozen bet that has certain numbers included in it. Several gambling professionals see this as a bet for suckers since players have to bet one unit on every number. However, several casinos allow this bet (though not all of them do).